Shady Records — ამერიკული ხმისჩამწერი ლეიბლი, დაარსებული 1999 წელს რეპერ ემინემის და მენეჯერ პოლ როზენბერგის მიერ. სახელწოდება შეიძინა ემინემის წარმატებული ალბომის The Slim Shady LP მიხედვით. დაარსებიდან Shady Records-მა გააფორმა კონტრაქტი ცამეტ შემსრულებელთან, ამჟამად კი რვას პატრონობს. იგი აგრეთვე მონაწილეობს რადიოსადგურ Shade 45-ის ბიზნესში და ჟურნალ XXL-ის მეშვეობით საკუთარ გამოცემას ბეჭდავს. იყო პერიოდი, როდესაც ემინემს და სხვა შემსრულებლებს ჰქონდა უთანხმოებები Royce da 5'9"-თან, ლეიბლთან Murder Inc. და ჟურნალთან The Source. ლეიბლის წარმატების ერთ-ერთი ეტაპი იყო ტურნეების სერია Anger Management და კომპილაციური Eminem Presents: The Re-Up. ფილმის „მერვე მილი“ საუნდტრეკის ჩაწერაში მონაწილეობდა როგორც ემინემი (რომელმაც მისთვის ჩაწერა შემდგომში წარმატებული „Lose Yourself“, ასევე hady Records-ის რამდენიმე შემსრულებელი. აღნიშნული ჩანაწერი აღინიშნა ოსკარით, რაც ჰიპ-ჰოპის ჟანრში სიმღერისთვის ყველაზე დიდი წარმატება იყო. ლეიბლის შემსრულებლებს წლების განმავლობაში RIAA-სგან მიღებული აქვთ მრავალი პლატინის ან უფრო მაღალი სტატუსი - 24 გამოცემული ალბომიდან 18-ის შემთხვევაში (ემინემის ჩანაწერის გარდა). შემსრულებლებს შორის არიან ემინემი, D12, Slaughterhouse, Yelawolf, Bad Meets Evil, Westside Gunn, Conway, & Hall N' Nash, ხოლო ყოფილი კლიენტები არიან 50 Cent, ობი ტრაისი, Stat Quo, ბობი კრიკუოტერი და Cashis. ემინემი დამაარსებელი 7 დეტროიტელი რეპერი, რომელმაც ლეიბლი 1999 წელს დააარსა. იქცა ჰიპ-ჰოპში ერთ-ერთ ყველაზე გაყიდვად შემსრულებლად. D12 1999 2 ჯგუფი, რომელშიც შედიან ემინემი, Bizarre, Mr. Porter, Kuniva, სვიფტი მაკვეი, მანამდე კი შედიოდნენ Proof, Bugz და Fuzz Scoota. ერთმანეთს იცნობდნენ მიჩიგანიდან, ადრეული წლებიდან. ეს არის პირველი ჯგუფი, რომელმაც ლეილბთან კონტრაქტი მოიპოვა. Slaughterhouse 2011 1 სუპერჯგუფი, რომელშიც შედიან ჯო ბადენი, ჯოელ ორტისი, Kxng Crooked და Royce da 5'9". ალბომი Welcome to: Our House 2012 წლის 28 აგვისტოს გამოსცა. Bad Meets Evil 2011 1 დუეტი, რომელშიც შედიან Royce da 5'9" და ემინემი. EP Hell: The Sequel 2011 წლის 14 ივნისს გამოსცა. Yelawolf 2011 2 Yelawolf-მა ლეიბლთან კონტრაქტი 2011 წელს გააფორმა და გამოსცა ორი ალბომი. Westside Gunn 2017 — Westside Gunn-მა ლეიბლთან კონტრაქტი 2013 წლის 3 მარტს გააფორმა, კონუეისთან ერთად. კონუეი 2017 — კონუეიმ ლეიბლთან კონტრაქტი 2013 წლის 3 მარტს გააფორმა, Westside Gunn-თან ერთად. Hall n' Nash 2017 — დუეტი ბუფალოდან. შედიან რეპერები Westside Gunn და კონუეი. ობი ტრაისი 2001–2008 2 დეტროიტელი რეპერი. მეორე შემსრულებელი, რომელმაც Shady Records-თან კონტრაქტი გააფორმა. ლეიბლი 2008 წელს დატოვა. ამჟამად აქვს საკუთარი ლეიბლი Black Market Entertainment. 50 Cent 2002–2014 5 კუინზელი რეპერი. ლეიბლებზე Shady, Aftermath და Interscope Records ოთხი ალბომი გამოუშვა. Shady 2014 წელს დატოვა და ამჟამად თანამშრომლობს ლეიბლებთან Caroline და Capitol. Interscope-თან კონტრაქტის დასრულების ფარგლებში 2017 წელს გამოსცა Best Of. Stat Quo 2003–2008 — ატლანტელი რეპერი. ისევე, როგორც ობი ტრაისი, ლეიბლს 2008 წელს დაშორდა და ამჟამად თანამშრომლობს Sha Money XL-ის Dream Big Ventures-თან. ბობი კრიკუოტერი 2005–2009 — ატლანტელი რეპერი. ლეიბლი 2009 წელს დატოვა. Cashis 2006–2011 1 კალიფორნიელი რეპერი, რომელმაც ლეიბლზე ერთი EP გამოსცა. თავისი ლეიბლიდან წასვლის შესახებ 2011 წელს გამოცემული მიქსტეიპის შესავალში ისაუბრა. თუმცა, როგორც სიმღერების თანაავტორი, ლეიბლთან კვლავ თანამშრომლობს. აქ წარმოდგენილია ყველა ალბომი, რომელიც Shady Records-ზე გამოვიდა Interscope Records-ის დისტრიბუციით. სხვადასხვა შემთხვევაში მითითებულია დამატებითი ლეიბლი. ემინემის რეპ-კოლექტივი D12, ლეიბლზე გამოსცა 2 ალბომი. ობი ტრაისი - გამოსცა ორი ალბომი და ლეიბლი 2008 წელს დატოვა. ↑ 50 Cent Leaves Shady Records, Aftermath Entertainment & Interscope Records. HipHopDX (თებერვალი 20, 2014). წაკითხვის თარიღი: თებერვალი 20, 2014. ↑ Connor, Martin. (ივლისი 3, 2013) Ca$his Discloses Ongoing Writing Agreement With Shady Records | Rappers Talk Hip Hop Beef & Old School Hip Hop. HipHop DX. წაკითხვის თარიღი: მარტი 18, 2014. ↑ The Marshall Mathers LP [Import Bonus CD - Eminem]. Billboard. წაკითხვის თარიღი: დეკემბერი 1, 2011. ↑ Devil's Night [Import Bonus CD - D12]. Billboard. წაკითხვის თარიღი: დეკემბერი 1, 2011. ↑ "Devil's Night RIAA-ს სერტიფიცირება". RIAA. Accessed იანვარი 23, 2008. ↑ Billboard, "The Eminem Show". Billboard.com. ↑ RIAA – Searchable Database: Eminem Show. Recording Industry Association of America. წაკითხვის თარიღი: დეკემბერი 26, 2011. ↑ 8 Mile - Original Soundtrack. Billboard. წაკითხვის თარიღი: დეკემბერი 1, 2011. ↑ "8 Mile Soundtrack RIAA-ს სერტიფიცირება". RIAA. Accessed იანვარი 23, 2008. ↑ Get Rich or Die Tryin' - 50 Cent. Billboard. წაკითხვის თარიღი: დეკემბერი 1, 2011. ↑ Cheers - Obie Trice. Billboard. წაკითხვის თარიღი: დეკემბერი 1, 2011. 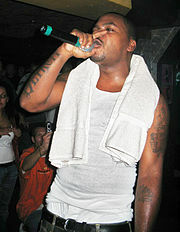 ↑ Gold & Platinum: Obie Trice. Recording Industry Association of America. წაკითხვის თარიღი: დეკემბერი 4, 2014. ↑ D12 World - D12. Billboard. წაკითხვის თარიღი: დეკემბერი 1, 2011. ↑ RIAA – Searchable Database: Encore. Recording Industry Association of America. წაკითხვის თარიღი: დეკემბერი 26, 2011. ↑ The Massacre - 50 Cent. Billboard. წაკითხვის თარიღი: დეკემბერი 1, 2011. ↑ Billboard, "Curtain Call: The Hits". Billboard.com. ↑ RIAA – Searchable Database: Curtain Call. Recording Industry Association of America. წაკითხვის თარიღი: დეკემბერი 26, 2011. ↑ Second Round's on Me - Obie Trice. Billboard. წაკითხვის თარიღი: დეკემბერი 1, 2011. ↑ Eminem Presents: The Re-Up - Eminem. Billboard. წაკითხვის თარიღი: დეკემბერი 1, 2011. 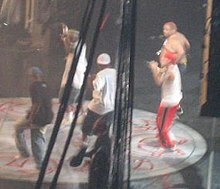 ↑ "Eminem Presents the Re-Up RIAA-ს სერტიფიცირება". RIAA. Accessed იანვარი 23, 2008. ↑ County Hounds - Cashis. Billboard. წაკითხვის თარიღი: დეკემბერი 1, 2011. ↑ Curtis - 50 Cent. Billboard. წაკითხვის თარიღი: დეკემბერი 1, 2011. ↑ RIAA – Searchable Database: Relapse. Recording Industry Association of America. წაკითხვის თარიღი: დეკემბერი 26, 2011. ↑ Before I Self Destruct - 50 Cent. Billboard. წაკითხვის თარიღი: დეკემბერი 1, 2011. ↑ RIAA – Searchable Database: Recovery. Recording Industry Association of America. წაკითხვის თარიღი: დეკემბერი 26, 2011. ↑ Keith Caulfield. (ივნისი 22, 2011) Eminem & Royce da 5'9" Debut at No. 1 on Billboard 200 with Bad Meets Evil EP. Billboard. წაკითხვის თარიღი: დეკემბერი 1, 2011. ↑ Cyrus Langhorne. (ნოემბერი 30, 2011) SALES WRAP: Rihanna Talks Her Way to the Top, Drake Loses His No. 1 Spot, Yelawolf Shocks the Chart. SOHH. წაკითხვის თარიღი: დეკემბერი 1, 2011.
ეს გვერდი ბოლოს დარედაქტირდა: 19:45, 9 აგვისტო 2018.